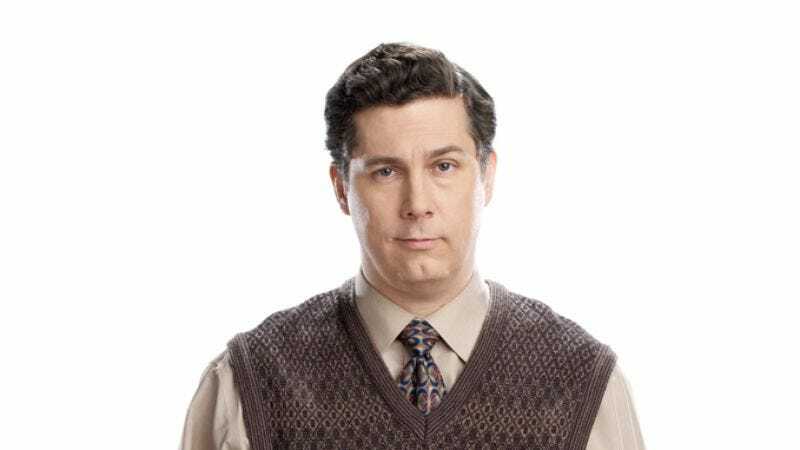 Chris Parnell can deadpan like no one else. It started on Saturday Night Live, where he spent 10 years off and on (he was fired at one point, rehired, then fired again), playing memorable goofs in the infamous “Cowbell” and “Lazy Sunday” sketches. His post-SNL career has been less deliberate: In spite of memorable roles in Hot Rod, Walk Hard: The Dewey Cox Story, and 30 Rock (as Dr. Spaceman) Parnell hasn’t found anything that stuck. He appeared as a principal in the underrated The Life & Times Of Tim, and as a vice principal on the short-lived Miss Guided, opposite Judy Greer, but the excellent single-camera show failed to find an audience. This year, though, Parnell has found some stability. He voices characters on Archer and WordGirl, and will co-star in Comedy Central’s new throwback (laugh track, multi-camera) sitcom Big Lake, starting August 17. Parnell plays a bitter high-school teacher who, with the help of Chris Gethard and Horatio Sanz, embarks on a series of schemes to swindle the small town of Big Lake out of its money. The deadpan is strong with this one; Parnell displays his gift of spinning even throwaway lines into comic gold. Prior to Big Lake’s première, The A.V. Club spoke to Parnell about his trepidation performing for a live audience, and his own experience as a teacher. The A.V. Club: Were you and Horatio Sanz brought on at the same time? It seems too perfect, you guys working together again. Chris Parnell: As far as I know, we were brought on at the same time. From the very first time I was hearing about it, I was hearing about Horatio too. AVC: What about the third person? CP: Horatio and I were part of the audition process when they were looking for a replacement [for Jon Heder]. We read with a few people, including Chris [Gethard]. In everybody’s eyes, he was the right guy. AVC: So were you part of the decision-making process as well? CP: I think loosely they wanted to know what Horatio and I thought. I think if one of us had said “I don’t like this guy,” that might have colored their decision-making. But Horatio had worked with Chris for 10 years at UCB. It was easy. We improvised a lot of the scene, and Horatio and Chris improvise together every week. AVC: Is the show improvised? CP: No, only a little part of it. Ninety-five percent is scripted. There’s definitely room for inspiration. We would do these things where we’d sit at the restaurant in a booth and just talk about a subject related to that episode. They were going to cut those things into bumpers at the end. That was improvised, but these are pretty well-crafted scripts. They’re not draconian about it, there’s certainly room to change something, and they encourage us to have input. AVC: Was the plan, as you understand it, always for the show to have a laugh track? CP: No, it was always up in the air. A lot of people, myself included, had the instinct not to use a laugh track. But once the people involved looked at it without the laugh track, they said it just didn’t work. In your mind, you’re so used to seeing the multi-camera sitcom format with a laugh track. If you see it without it, you’re like, “Something’s wrong.” They screened all the episodes at the UCB Theatre in New York and recorded their laughter. AVC: How does the laugh track affect your performance, if at all? CP: You know, it doesn’t at all. One of the things that was discussed in the very beginning, about whether to use a laugh track, was wondering if we should just let the crew laugh at the jokes and give us a sense of where the laughs would go and give us a sense of timing. But again, we quickly realized that if we do that, then we’re absolutely committed to the laugh track, because we have laughter in the background. So we did it without anyone responding. We did it as if we were on a single-camera show. AVC: How was the adjustment to multi-camera after single-camera shows like 30 Rock and Miss Guided? CP: I like single-camera a lot. I’d done multi-camera before, but what I liked about this was not having an audience there. While there’s a lot to be said about having feedback from an audience, I would rather just focus on the work and give the best performance without having to worry about whether they’re laughing at a joke. AVC: Was that something you struggled with on Saturday Night Live? CP: I’d come out of Groundlings, so I was used to performing in front of a little theater audience, but there was definitely a learning curve [on SNL], and I don’t know if I ever quite mastered it. One of the hard things was always trying to do the scene with the other person—act it well and be in the moment. We also had cue cards, and even though I would try to memorize my lines, it didn’t necessarily serve me well to play the scene that way, because if it’s a deep set, and your cameras are in the front, you’re going to be looking across to somebody, and the cameras are only going to get you in profile. The people who knew how to use the cue cards—they pull your eye out toward the front of the set, and therefore the camera can see your face better, therefore the audience can see what you’re doing and react better. Some people would just play it flat-out, looking straight out to the audience or toward the camera, and not even really look at you, but it would often work really well. AVC: Do you still watch the show? CP: Yeah, I do, actually. AVC: Can you tell when someone is acting for the other person in the scene versus acting for the studio audience? CP: Uh… I guess. I don’t tend to think of it that way when I see it, though. It’s either working or it’s not. I’m not necessarily analyzing from an acting point of view. AVC: Having been on the show for a while, are you able to pinpoint what’s not working? CP: I’m not a good enough technician to articulate that. For me, it’s either hosts are working or they’re not working. Sometimes you have a very funny host but the material doesn’t rise to the occasion, or you have a host who’s not a great comedy performer. AVC: What has SNL afforded you in recent auditions? Are you still known from that show? CP: A lot of people seem to think I’m still on the show, which is not a bad thing. People will say, “Love you on SNL; are you guys on hiatus?” I don’t know why they think that. They’re either watching reruns, or they caught me when I came back for the presidential-debate sketches a few years ago, or they get used to seeing you on there. I find there’s usually a lag between when I got on SNL and when people started recognizing me and knowing I was on. The converse is that even though I’ve been off the show four, going on five years now, people still think I’m on there. It’ll take a while for people to realize that. AVC: You were on Miss Guided, in a part that was perfect for you that unfortunately wound up being short-lived. Now you’ve got Archer, which has some buzz behind it, and Big Lake. Do you consider Big Lake’s longevity? CP: I think about it two ways. Sometimes you will say yes to a job that is not your dream job if it’s pretty good. If it gets picked up, great. Miss Guided was a dream job. And with Big Lake, I agreed to do it before I’d even read the pilot. When I actually got the first script and read what my part was… [Laughs.] I was glad that I had trusted my instincts. It’s a part that was written with me in mind; it’s not always easy, but it makes it fun for me to play. I do think about the longevity—I’m sure you know, but if we make a certain rating, we’ll get picked up for 90 more episodes. I don’t know what that magic number is, nor do I have any idea if we’ll come close to making it, but if we do—it’s this deal called the “Tyler Perry model,” as I understand it. It’s something he created with his business guy, the point being to get the show into syndication in a much shorter time frame. You do the first 10, then if you get that rating, you get the order for the back 90. We might not make that mark, and Comedy Central could like it and order, I dunno, another 20 or something. I just hope people watch—it looks on the surface like a typical old-fashioned sitcom, but what’s going on is nastier and darker, more amoral. And hopefully funny. AVC: Are you seeking more stability in your career? Is that the right word? CP: That’s absolutely right. Even though my time at SNL was—I got fired twice, but even with that, I still enjoyed going to work. I like doing television because if you’re lucky and on a show that goes, you go into work every week with the same people you get to know them. I enjoy that. Not that I don’t like doing the occasional movie when they come along, but I like TV. And I think I’m going to be doing more 30 Rocks. AVC: After graduating college, you went back to your old high school to teach drama. How much of that experience did you draw on for Big Lake? CP: I guess I bring a little bit. I went back and taught classes I had taken when I was there. I was hired by this guy named Frank Bluestein; he was my real-life mentor and still a very good friend. He was the guy who inspired me to go off and pursue a career in acting and all that. So when he invited me to come back, I was disillusioned and unsure what I was doing. It was very, very hard. I was, like, 24 and not at all ready to be an authority figure; not a good disciplinarian. In every given class, you had a core of people who were very good students, very attentive—either cared about what you talked about, or cared about making good grades, so they paid attention. Then there was a larger group that was sort of ho-hum, whatever. Then there was this other group that were the real jackasses. They made teaching difficult. The teaching part, from when the bell rang to when class got out, I really struggled. After the bell rang and I was working with the kids in the theater, they were great. I did quickly get burnt out on the day-to-day teaching. I’m certainly not as cynical as my character—I just think some high-school kids are assholes. I was trying to do what I thought I was supposed to be doing—embody that role in the way I would if I were acting the part. I had to dress up every day, wear a sport coat and tie. It was all right, just very different from all of my life up to that point, and most of my life since then. AVC: Have you taught at all since leaving that job? CP: I have not. I considered teaching at the Groundlings, but I didn’t because you invariably have to cut people from your class. I never wanted to have to make that call. I want everybody to like me. AVC: Do you remember a specific moment as a teacher where you had to discipline somebody?